It has felt like a long week. Which is odd because it was a short one really, due to the bank holiday at the start of it. Firstly, our friends didn’t come round for dinner last Saturday after all. They had some personal issues to deal with and weren’t up to socialising. Big karma hugs to both of them. I’ve done fairly well work-wise this week. I not only made it in to the office 3 mornings out of 4, I managed to time those days for when the fairly-high and really-high bosses were there. Result! I had a down day on Thurs when I didn’t get up on time, in lots of pain from the start of the day and couldn’t quite think clearly all day. I made up for it with a good day on Friday. 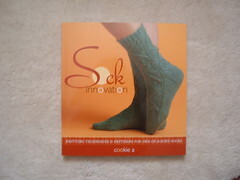 It’s the new sock book by Cookie A, who designs some lovely socks. Part of the book is about designing socks, which is really interesting and could be useful. I’ve waited weeks for this, since before our holiday. In fact, I ordered it in time to take it on holiday, or so I thought. I don’t know what went wrong, but almost no-one was able to get hold of a copy for a while, and as recently as yesterday my order status said ‘we’ll let you know when we have the faintest idea when we might send this to you’, or words to that effect. Hooray! I got my prize! This week I have a team meeting in Bristol on Tuesday, and lunch planned with my friend Caron on Wednesday. The start of the team meeting has been delayed by an hour, but T from Plymouth and I have decided to catch our usual trains and meet for coffee before the meeting. It’ll be nice to catch up, and have longer than the brisk walk to the office for once. So cute! 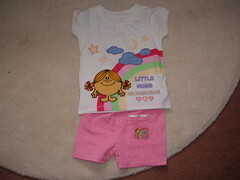 I’ll deliver ladybird and ‘jamas to Caron on Weds and hopefiully get a couple of pictures in return. I’m pleased with how they turned out. Ali was really happy with it, even though the spot pattern isn’t quite right. I have offered to re-do the spots, but she just wanted to take it home. 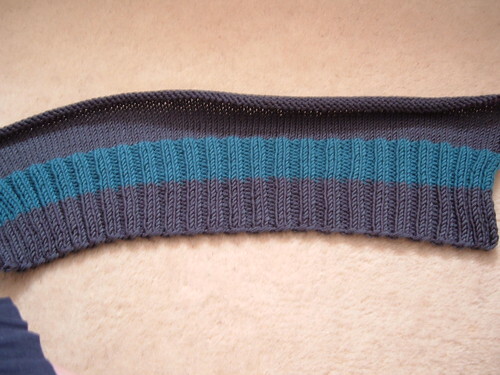 And finally, the scarf. 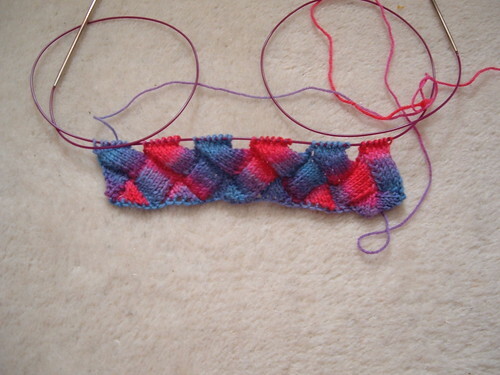 It’s an entrelac pattern, which is the only thing I’ve found to suit this particular sock yarn. 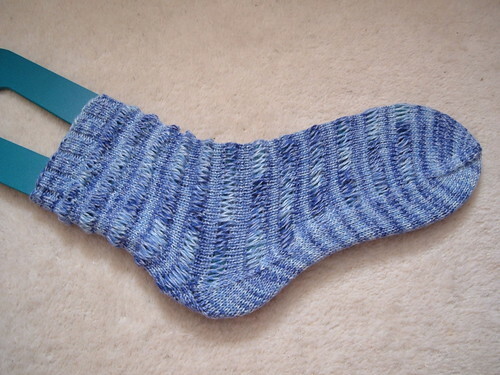 I love the mad colours of it, but the colour changes are just a bit too much for all the sock patterns I tried. The intention was that I’d have this as a smaller project for travelling with…but now I’ve got the new sock book…maybe some socks are in order?! I had a discussion with my niece a few weeks ago. I was showing her some of the things I’ve knitted recently, and some of the things I’m planning to knit, and she asked me why I don’t knit for her any more. I always used to include a hand made gift in their birthday presents, but haven’t for a year or so now. For a start, we have 13 nieces and nephews, and several we include as step-relations. Secondly, they just don’t appreciate them. I pointed this out to M, and she went quiet. An hour or so later she started raving about the cushion I knitted for her birthday one year. Did it take her that long to remember the last thing I made for her? Or was she just trying to decide what her favourite gift was? Anyway, M herself put a successful end to the conversation when she said about the cardigan I was showing her “I don’t know why you don’t just go to Primark and buy one for £6”! 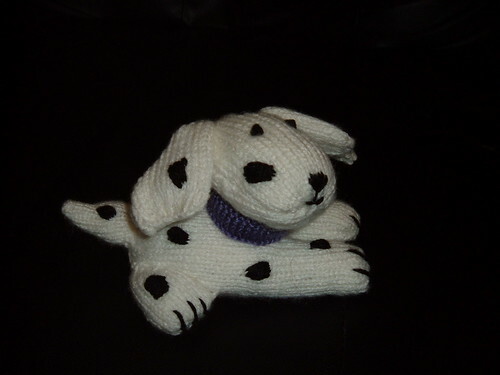 This entry was posted on May 30, 2009 at 10:40 am and is filed under Family, Health, knitting, Work. You can follow any responses to this entry through the RSS 2.0 feed. You can leave a response, or trackback from your own site.